When parallel fan powered boxes are required for the baseline building, fans shall run as the first stage of heating before the reheat coil is energized. Fans in parallel VAV fan-powered boxes shall be sized for 50% of the peak design primary air (from the VAV air-handling unit) flow rate and shall be modeled with 0.35 W/cfm fan power. Minimum volume setpoints for fan-powered boxes shall be equal to 30% of peak design primary airflow rate or the rate required to meet the minimum outdoor air ventilation requirement, whichever is larger. The supply air temperature setpoint shall be constant at the design condition. Single Maximum VAV Box Fan Control: With parallel style fan powered VAV boxes, the terminal unit fan is only on when the zone is in heating mode. When the fan is running, the box mixes plenum air with primary air. Heating Operation: During heating mode, the SAT is increased from minimum to the design heating temperature. Throughout heating the cooling primary airflow is kept at design minimum. Deadband Operation: The cooling primary airflow is kept at minimum airflow and the heating valve is closed. 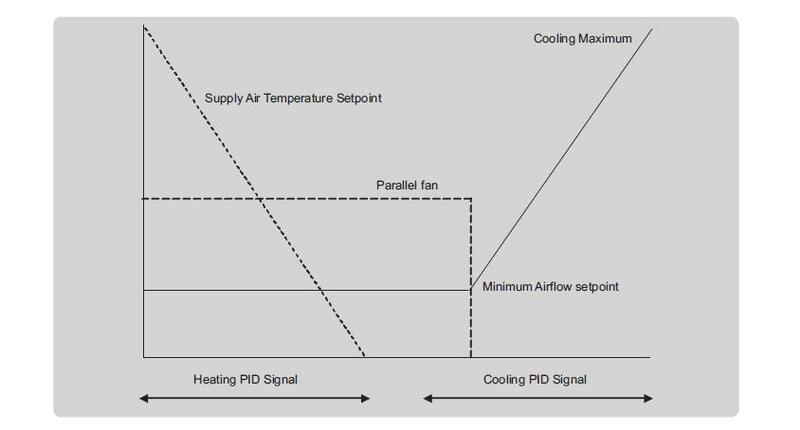 Cooling Operation: As the space temperature increases the cooling supply airflow is increased from minimum to design cooling maximum. Throughout cooling the VAV box fan is off. To comply with Section 6.5.2.1 Exception a, the minimum supply airflow for this control logic must be no larger than 30% of the zone design cooling airflow or the minimum airflow for ventilation. Single Maximum with minimum air flow rate set to 30% of peak design primary air flow rate or the outside air ventilation rate, whichever is larger. Systems serving laboratory spaces shall reduce the exhaust and makeup air volume during unoccupied periods to the largest of 50% of zone peak airflow, the minimum outdoor airflow rate, or the airflow rate required to comply with applicable codes or accreditation standards. For baseline system 11, minimum volume setpoint shall be 50% of the maximum design airflow rate, the minimum ventilation outdoor airflow rate, or the airflow rate required to comply with applicable codes or accreditation standards, whichever is larger. Fan volume shall be reset from 100% airflow at 100% cooling load to minimum airflow at 50% cooling load. Supply air temperature setpoint shall be reset from minimum supply air temperature at 50% cooling load and above to space temperature at 0% cooling load. In heating mode supply air temperature shall be modulated to maintain space temperature, and fan volume shall be fixed at the minimum airflow.